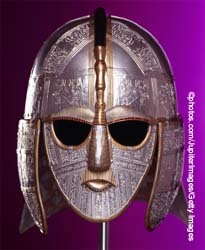 This summer sees the Festival of British Archaeology (18 July to 2 August 2009) and the 70th anniversary of the discoveries at Sutton Hoo making it the perfect time for an archaeology-themed creative topic. Digging up the past and discovering historical treasures should not be confined to the world of Indiana Jones as there are lots of opportunities for discovery, learning and adventure in the classroom. The archaeological missions that make up this month’s creative topic focus on Saxon artefacts and the history surrounding the Sutton Hoo Saxon burial ground. Particularly through the use of drama, this topic aims to place children’s learning into a real-life context – to bring the past to life and set the scene for an unforgettable cultural experience.